Ariane 5 is a European heavy lift launch vehicle that is part of the Ariane rocket family, an expendable launch system used to deliver payloads into geostationary transfer orbit (GTO) or low Earth orbit (LEO). Ariane 5 rockets are manufactured under the authority of the European Space Agency (ESA) and the Centre National d'Etudes Spatiales. Airbus Defence and Space is the prime contractor for the vehicles, leading a consortium of sub-contractors. Ariane 5 is operated and marketed by Arianespace as part of the Ariane programme. Airbus Defence and Space builds the rockets in Europe and Arianespace launches them from the Guiana Space Centre in French Guiana. Ariane 5 succeeded Ariane 4, but was not derived from it directly. Ariane 5 has been refined since the first launch in successive versions, "G", "G+", "GS", "ECA", and most recently, "ES". ESA originally designed Ariane 5 to launch the Hermes spaceplane, and thus intended it to be human rated from the beginning. Two satellites can be mounted using a SYLDA carrier (SYstème de Lancement Double Ariane). Three main satellites are possible depending on size using SPELTRA (Structure Porteuse Externe Lancement TRiple Ariane). Up to eight secondary payloads, usually small experiment packages or minisatellites, can be carried with an ASAP (Ariane Structure for Auxiliary Payloads) platform. As of July 2015 Arianespace has signed contracts for Ariane 5 ECA launches up till 2023, after planned introduction of Ariane 6 in 2020. On 5 October 2016, Ariane 5 performed its 74th consecutive successful mission since 2003. 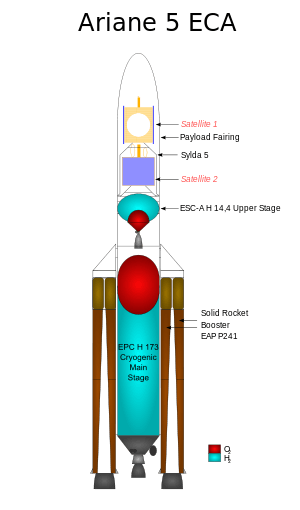 Ariane 5’s cryogenic H173 main stage (H158 for Ariane 5 G, G+, and GS) is called the EPC (Étage Principal Cryotechnique—Cryotechnic Main Stage). It consists of a large tank 30.5 metres high with two compartments, one for liquid oxygen and one for liquid hydrogen, and a Vulcain 2 engine at the base with a vacuum thrust of 1,390 kilonewtons (310,000 pounds-force). The H173 EPC weighs about 189 tonnes, including 175 tonnes of propellant. After the main cryogenic stage runs out of fuel, it can re-enter the atmosphere for an ocean splashdown. Attached to the sides are two P241 (P238 for Ariane 5 G and G+) solid rocket boosters (SRBs or EAPs from the French Étages d’Accélération à Poudre), each weighing about 277 tonnes full and delivering a thrust of about 7,080 kilonewtons (1,590,000 pounds-force). They are fueled by a mix of ammonium perchlorate (68%) and aluminum fuel (18%) and polybutadiene (14%). They each burn for 130 seconds before being dropped into the ocean. The SRBs are usually allowed to sink to the bottom of the ocean, but like the Space Shuttle Solid Rocket Boosters they can be recovered with parachutes, and this has occasionally been done for post-flight analysis. (Unlike Space Shuttle SRBs Ariane 5 boosters are not reused.) The most recent attempt was for the first Ariane 5 ECA mission. One of the two boosters was successfully recovered and returned to the Guiana Space Center for analysis. Prior to that mission, the last such recovery and testing was done in 2003. The French M51 SLBM shares a substantial amount of technology with these boosters. In February 2000 the suspected nose cone of an Ariane 5 booster washed ashore on the South Texas coast, and was recovered by beachcombers before the government could get to it. The second stage is on top of the main stage and below the payload. The Ariane 5 G used the EPS (Étage à Propergols Stockables—Storable Propellant Stage), which is fueled by monomethylhydrazine (MMH) and nitrogen tetroxide. It also has 10 tonnes of storable propellants. The EPS was improved for use on the Ariane 5 G+, GS, and ES. Ariane 5 ECA uses the ESC (Étage Supérieur Cryotechnique—Cryogenic Upper Stage), which is fueled by liquid hydrogen and liquid oxygen. The EPS upper stage is capable of multiple ignitions, first demonstrated during flight V26 which was launched on 5 October 2007. This was purely to test the engine, and occurred after the payloads had been deployed. The first operational use of restart capability as part of a mission came on 9 March 2008, when two burns were made to deploy the first Automated Transfer Vehicle into a circular parking orbit, followed by a third burn after ATV deployment to de-orbit the stage. This procedure was repeated for all subsequent ATV flights. The payload and all upper stages are covered at launch by a fairing, which is jettisoned once sufficient altitude has been reached (typically above 100 km). The Fairing is also used for aerodynamic stability and protection from heating during supersonic flight and acoustic loads. G The original version is dubbed Ariane 5 G (Generic) and had a launch mass of 737 tonnes. Its payload capability to geostationary transfer orbit (GTO) was 6,900 kg (15,200 lb) for a single satellite or 6,100 kg (13,400 lb) for dual launches. It flew 17 times with one failure and two partial failures. G+ The Ariane 5 G+ had an improved EPS second stage, with a GTO capacity of 7,100 kg (15,700 lb) for a single payload or 6,300 kg (13,900 lb) for two. It flew three times in 2004, with no failures. GS At the time of the failure of the first Ariane 5 ECA flight in 2002, all Ariane 5 launchers in production were ECA versions. Some of the ECA cores were modified to use the original Vulcain engine and tank volumes while the failure was investigated; these vehicles were designated Ariane 5 GS. The GS used the improved EAP boosters of the ECA variant and the improved EPS of the G+ variant, but the increased mass of the modified ECA core compared to the G and G+ core resulted in slightly reduced payload capacity. Ariane 5 GS could carry a single payload of 6,600 kg (14,600 lb) or a dual payload of 5,800 kg (12,800 lb) to GTO. The Ariane 5 GS flew 6 times from 2005 to 2009 with no failures. ECA The Ariane 5 ECA (Evolution Cryotechnique type A), first successfully flown in 2005, uses an improved Vulcain 2 first-stage engine with a longer, more efficient nozzle with a more efficient flow cycle and denser propellant ratio. The new ratio required length modifications to the first-stage tanks. The EPS second stage was replaced by the ESC-A (Etage Supérieur Cryogénique-A), which has a dry weight of 2,100 kg (4,600 lb) and is powered by an HM-7B engine burning 14,000 kg (31,000 lb) of cryogenic propellant. The ESC-A uses the liquid oxygen tank and lower structure from the Ariane 4's H10 third stage, mated to a new liquid hydrogen tank. Additionally, the EAP booster casings were lightened with new welds and carry more propellant. The Ariane 5 ECA has a GTO launch capacity of 9,100 kg (20,100 lb) for dual payloads or 9,600 kg (21,200 lb) for a single payload. ES The Ariane 5 ES (Evolution Storable) has an estimated LEO launch capacity of 21,000 kg (46,000 lb). It includes all the performance improvements of Ariane 5 ECA core and boosters but replaces the ESC-A second stage with the restartable EPS used on Ariane 5 GS variants. It was used to launch the Automated Transfer Vehicle (ATV) into a 260 km circular low Earth orbit inclined at 51.6° and has been used to launch four Galileo navigation satellites at a time directly into their operational orbit. ME (cancelled) The Ariane 5 ME (Mid-life Evolution) was under development until end of 2014. The last ESA ministerial council of December 2014 has cut further funding for Ariane 5 ME in favour of developing Ariane 6. Last activities for Ariane 5 ME should be completed for end of 2015. Activities on development of the VINCI upper stage have been transferred on Ariane 6. As of November 2014, the Ariane 5 commercial launch price for launching a "midsize satellite in the lower position" is approximately US$60 million, competing for commercial launches in an increasingly competitive market, mainly due to SpaceX. The heavier satellite launched in the upper position on a typical dual-satellite Ariane 5 launch is priced higher, on the order of €90 million. Total launch price of an Ariane 5—which can transport up to two satellites to space, one in the "upper" and one in the "lower" positions—is around 150 million Euro as of January 2015. The Ariane 5 ME (Mid-life Evolution) was in development until 2015 and seen as a stopgap between Ariane 5 ECA/Ariane 5 ES and the new Ariane 6. With first flight planned for 2018, it would have become ESA's principal launcher until the arrival of the new Ariane 6 version. The Ariane 5 ME uses a new upper stage, with increased propellant volume, powered by the new Vinci engine. Unlike the HM-7B engine, it can restart several times, allowing for complex orbital maneuvers such as insertion of two satellites into different orbits, direct insertion into geosynchronous orbit, planetary exploration missions, and guaranteed upper stage deorbiting or insertion into graveyard orbit. The new launcher also includes a lengthened fairing up to 20m and a new dual launch system to accommodate larger satellites. Compared to an Ariane 5 ECA model, the payload to GTO increases by 15% to 11.5 tonnes and the cost-per-kilogram of each launch is projected to decline by 20%. Originally known as the Ariane 5 ECB, Ariane 5 ME was to have its first flight in 2006. However, the failure of the first ECA flight in 2002, combined with a deteriorating satellite industry, caused ESA to cancel development in 2003. Development of the Vinci engine continued, though at a lower pace. The ESA Council of Ministers agreed to fund development of the new upper stage in November 2008. In 2009, EADS Astrium was awarded a €200 million contract, and on April 10, 2012 received another €112 million contract to continue development of the Ariane 5 ME with total development effort expected to cost €1 billion. On 21 November 2012, ESA agreed to continue with the Ariane 5 ME to meet the challenge of lower priced competitors. It was agreed the Vinci upper stage would also be used as the second stage of a new Ariane 6, and further commonality would be sought. Ariane 5 ME qualification flight is scheduled for mid-2018, followed by gradual introduction into service. On 2 December 2014, ESA decided to stop funding the development of Ariane 5 ME and instead focus on Ariane 6 which should have a lower cost per launch and allow more flexibility in the payloads (using two or four P120C solid boosters depending on total payload mass). Work on the Ariane 5 EAP motors have been continued in the Vega programme. 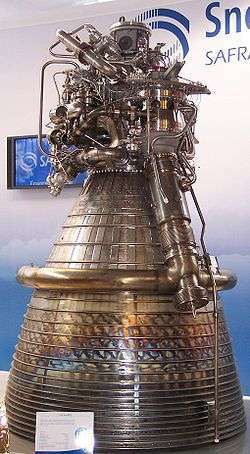 The Vega 1st stage engine—the P80 engine—is a shorter derivation of the EAP. The P80 booster casing is made of filament wound graphite epoxy, much lighter than the current stainless steel casing. A new composite steerable nozzle has been developed while new thermal insulation material and a narrower throat improve the expansion ratio and subsequently the overall performance. Additionally, the nozzle now has electromechanical actuators which have replaced the heavier hydraulic ones used for thrust vector control. These developments will probably later make their way back into the Ariane programme. The incorporation of the ESC-B with the improvements to the solid motor casing and an uprated Vulcain engine would deliver 27,000 kilograms (60,000 lb) to LEO. This would be developed for any lunar missions but the performance of such a design may not be possible if the higher Max-Q for the launch of this rocket poses a constraint on the mass delivered to orbit. The design brief of the next generation rocket Ariane 6 called for a lower-cost and smaller rocket capable of launching a single satellite of up to 6.5 tonnes to GTO. However, after several permutations the finalized design was nearly identical in performance to the Ariane 5, even though a lower per-launch price is projected. Development is projected to cost €4 billion. Its first test launch is set for 2021. As of March 2014, Ariane 6 is projected to be launched for about €70 million per flight or about half of the Ariane 5 rocket's current price. Ariane 5's first test flight (Ariane 5 Flight 501) on 4 June 1996 failed, with the rocket self-destructing 37 seconds after launch because of a malfunction in the control software. A data conversion from 64-bit floating point value to 16-bit signed integer value to be stored in a variable representing horizontal bias caused a processor trap (operand error) because the floating point value was too large to be represented by a 16-bit signed integer. The software was originally written for the Ariane 4 where efficiency considerations (the computer running the software had an 80% maximum workload requirement) led to four variables being protected with a handler while three others, including the horizontal bias variable, were left unprotected because it was thought that they were "physically limited or that there was a large margin of error". The software, written in Ada, was included in the Ariane 5 through the reuse of an entire Ariane 4 subsystem despite the fact that the particular software containing the bug, which was just a part of the subsystem, was not required by the Ariane 5 because it has a different preparation sequence than the Ariane 4. The second test flight (L502, on 30 October 1997) was a partial failure. The Vulcain nozzle caused a roll problem, leading to premature shutdown of the core stage. The upper stage operated successfully, but it could not reach the intended orbit. A subsequent test flight (L503, on 21 October 1998) proved successful and the first commercial launch (L504) occurred on 10 December 1999 with the launch of the XMM-Newton X-ray observatory satellite. Another partial failure occurred on 12 July 2001, with the delivery of two satellites into an incorrect orbit, at only half the height of the intended GTO. The ESA Artemis telecommunications satellite was able to reach its intended orbit on 31 January 2003, through the use of its experimental ion propulsion system. The next launch did not occur until 1 March 2002, when the Envisat environmental satellite successfully reached an orbit 800 km above the Earth in the 11th launch. At 8111 kg, it was the heaviest single payload until the launch of the first ATV on 9 March 2008 (19,360 kg). The first launch of the ECA variant on 11 December 2002 ended in failure when a main booster problem caused the rocket to veer off-course, forcing its self-destruction three minutes into the flight. Its payload of two communications satellites (Stentor and Hot Bird 7), valued at about EUR 630 million, was lost in the ocean. The fault was determined to have been caused by a leak in coolant pipes allowing the nozzle to overheat. After this failure, Arianespace SA delayed the expected January 2003 launch for the Rosetta mission to 26 February 2004, but this was again delayed to early March 2004 due to a minor fault in the foam that protects the cryogenic tanks on the Ariane 5. As of April 2014, the failure of the first ECA launch was the last failure of an Ariane 5; since then, all subsequent launches have been successful, with 69 consecutive successes that stretch back to 9 April 2003 with the launch of INSAT-3A and Galaxy 12 satellites. On 27 September 2003 the last Ariane 5 G boosted three satellites (including the first European lunar probe, SMART-1), in Flight 162. On 18 July 2004 an Ariane 5 G+ boosted what was at the time the heaviest telecommunication satellite ever, Anik F2, weighing almost 6,000 kg. The first successful launch of the Ariane 5 ECA took place on 12 February 2005. The payload consisted of the XTAR-EUR military communications satellite, a 'SLOSHSAT' small scientific satellite and a MaqSat B2 payload simulator. The launch had been originally scheduled for October 2004, but additional testing and the military requiring a launch at that time (of a Helios 2A observation satellite) delayed the attempt. On 11 August 2005, the first Ariane 5 GS (featuring the Ariane 5 ECA's improved solid motors) boosted Thaïcom-4/iPStar-1, the heaviest telecommunications satellite to date at 6,505 kg, into orbit. On 16 November 2005, the third Ariane 5 ECA launch (the second successful ECA launch) took place. It carried a dual payload consisting of Spaceway-F2 for DirecTV and Telkom-2 for PT Telekomunikasi of Indonesia. This was the rocket's heaviest dual payload to date, at more than 8,000 kg. On 27 May 2006, an Ariane 5 ECA rocket set a new commercial payload lifting record of 8.2 tonnes. The dual-payload consisted of the Thaicom 5 and Satmex 6 satellites. On 4 May 2007 the Ariane 5 ECA set another new commercial record, lifting into transfer orbit the Astra 1L and Galaxy 17 communication satellites with a combined weight of 8.6 tonnes, and a total payload weight of 9.4 tonnes. This record was again broken by another Ariane 5 ECA, launching the Skynet 5B and Star One C1 satellites, on 11 November 2007. The total payload weight for this launch was 9,535 kg. On 1 July 2009, an Ariane 5 ECA launched TerreStar-1, the largest commercial telecommunication satellite ever built. On 28 October 2010, an Ariane 5 ECA launched Eutelsat's W3B (part of its W Series of satellites) and Broadcasting Satellite System Corporation (B-SAT)'s BSAT-3b satellites into orbit. However, the W3B satellite failed to operate shortly after the successful launch and was written off as a total loss due to an oxidizer leak in the satellite's main propulsion system. The BSAT-3b satellite, however, is operating normally. On 22 April 2011, the Ariane 5 ECA flight VA-201 broke a commercial record, lifting Yahsat 1A and Intelsat New Dawn with a total payload weight of 10,064 kg to transfer orbit. This record was later broken again during the launch of Ariane 5 ECA flight VA-208 on 2 August 2012, lifting a total of 10,182 kg into the planned geosynchronous transfer orbit, which was broken again 6 months later on flight VA-212 with 10,317 kg sent towards geosynchronous transfer orbit. In June 2016 the GTO record was raised to 10,730 kg, on the first rocket in history that carried a satellite dedicated to financial institutions. The payload record was pushed a further 5 kg to 10,735 kg (23,667 lb) on 24 August with the launch of Intelsat 33e and Intelsat 36. Ariane 5 rockets have accumulated 89 launches since 1996, 85 of which were successful, yielding a 7001955000000000000♠95.5% success rate. Between April 2003 and November 2016, Ariane 5 has flown 75 consecutive missions without failure. Ariane 5 launch statistics as of November 2016 (including all 89 launches since 1996). Source: data from wikitable Launch history. 1 2 3 4 5 6 7 8 9 10 11 12 13 14 15 Future Ariane 5 GTO payloads still need to be paired. ↑ "Arianespace aims high in Asia-Pacific". Flightglobal. Retrieved 1 June 2016. 1 2 "Ariane 5 ES". ESA. Retrieved 27 August 2014. 1 2 3 4 "Intelsat Pair lifted into Orbit in Record-Setting Ariane 5 Launch". Spaceflight 101. 24 August 2016. Retrieved 25 August 2016. ↑ "Arianespace and EUMETSAT announce signature of launch contract for three MTG satellites" (Press release). Evry: Arianespace. 16 July 2015. Retrieved 20 July 2015. ↑ "Ariane 6". ESA. 15 June 2015. Retrieved 20 July 2015. ↑ "Ariane 5 Data Sheet". Space Launch Report. Retrieved 8 November 2014. ↑ "France in Space #387". Office of Science and Technology Embassy of France in the USA. ↑ "Government Loses Unidentified Floating Object". foxnews.com. Archived from the original on 24 February 2001. ↑ "Ariane-5G". Gunter's Space Page. Retrieved 6 September 2014. ↑ "Ariane-5G+". Gunter's Space Page. Retrieved 6 September 2014. ↑ "Ariane 5 Evolution" (in German). Retrieved 8 November 2014. ↑ "Ariane-5GS". Gunter's Space Page. Retrieved 6 September 2014. ↑ "Ariane-5ECA". Gunter's Space Page. Retrieved 6 September 2014. ↑ de Selding, Peter B. (2013-11-25). "SpaceX Challenge Has Arianespace Rethinking Pricing Policies". Space News. Retrieved 2013-11-27. The Arianespace commercial launch consortium is telling its customers it is open to reducing the cost of flights for lighter satellites on the Ariane 5 rocket in response to the challenge posed by SpaceX’s Falcon 9 rocket. 1 2 Peter B. de Selding (January 5, 2015). "With Eye on SpaceX, CNES Begins Work on Reusable Rocket Stage". spacenews.com. Retrieved 6 January 2015. 1 2 3 "ESA - Adapted Ariane 5 ME". 1 2 3 Stephen Clark (21 November 2012). "European ministers decide to stick with Ariane 5, for now". Spaceflight Now. Retrieved 22 November 2012. ↑ "ESA cancels plans for uprated Ariane 5 ECB". ↑ "ESA's Council of Ministers decides the future of European space exploration". ↑ "ESA signs contract for Ariane 5 rocket enhancements". ↑ "ESA Gives Astrium $150M To Continue Ariane 5 ME Work". ↑ Messier, Dough (18 January 2014). "ESA Faces Large Cost for Ariane 5 Upgrade". parabolicarc.com. Retrieved 9 May 2014. ↑ Kyle, Ed (3 December 2014). "Ariane 6". Space Launch Report. Retrieved 17 July 2015. ↑ Usa, Usa Ibp (2010). European Space Policy and Programs Handbook. Int'l Business Publications. p. 29. ISBN 9781433015328. ↑ "Successful firing of Vega's first-stage motor in Kourou". ESA. November 30, 2006. ↑ David Iranzo-Greus (23 March 2005). "Ariane 5—A European Launcher for Space Exploration". EADS SPACE Transportation. Archived from the original (PowerPoint presentation) on 11 September 2008. Retrieved 10 April 2008. 1 2 Clark, Stephen (27 March 2014). "Germany calls for redesign of next-generation Ariane". spaceflightnow.com. Retrieved 8 May 2014. 1 2 3 4 "Ariane 5 Flight 501 Failure, Report by the Inquiry Board". esamultimedia.esa.int. Archived from the original (PDF) on 2000-08-15. ↑ "iPStar 1 (Thaicom 4)". skyrocket.de. ↑ "Ariane lifts record dual payload". BBC NEWS. May 27, 2006. ↑ "Ariane 5 – second launch of six in 2007". ESA. May 5, 2007. ↑ "Ariane 5 – fifth launch of six in 2007". ESA. November 11, 2007. ↑ "EUTELSAT STATEMENT on LOSS OF W3B SATELLITE" (Press release). Eutelsat Communications. 29 October 2010. Archived from the original on 1 November 2010. Retrieved 30 October 2010. ↑ "All Systems Are Nominal Aboard Lockheed Martin Bsat-3b Satellite Following Oct. 28 Launch". Lockheed Martin. 2010-11-04. 1 2 "Arianespace launch a success: Yahsat Y1A and Intelsat New Dawn in orbit". Arianespace. April 22, 2011. ↑ "Arianespace launch a success: Ariane 5 ECA orbits INTELSAT 20 and HYLAS 2 satellites". Arianespace. August 2, 2012. ↑ "Arianespace orbits Amazonas-3 and Azerspace/Africasat-1a satellites; First Ariane 5 ECA mission in 2013 a success". Arianespace. February 7, 2013. ↑ "V88 Ariane 501" (in French). 1997. ↑ "Ariane 502—Results of detailed data analysis". ESA. 1998-04-08. ↑ "Ariane Launch Report: Ariane 5 failure investigation focuses on upper stage". spaceflightnow.com. 2001-07-13. ↑ "Arianespace releases initial information on Flight 157". ESA. 2002-12-12. ↑ "First Ariane launch of 2006". ESA. 2006-03-12. ↑ "Ariane 5 ECA carries record payload mass to GTO". ESA. 2006-05-28. ↑ "Ariane 5 launches two telecommunications satellites". ESA. 2006-08-12. ↑ "Fourth Ariane 5 launch of 2006". ESA. 2006-10-16. ↑ "Fifth Ariane 5 launch completes a busy year". ESA. 2006-12-09. ↑ "First Ariane 5 launch of 2007". ESA. 2007-03-12. ↑ "Ariane 5 – second launch of six in 2007". ESA. 2007-05-05. ↑ "Arianespace boosts SPACEWAY 3 and BSAT-3a into orbit". Arianespace. August 14, 2007. ↑ "Arianespace boosts Intelsat 11 and Optus D2 into orbit". Arianespace. October 5, 2007. ↑ "Ariane 5—fifth launch of six in 2007". ESA. 2007-11-15. ↑ "Sixth successful Arianespace mission in 2007: RASCOM-QAF1 and Horizons-2 in orbit". Arianespace. December 21, 2007. ↑ "Mission Accomplished! Arianespace launches Jules Verne ATV to the International Space Station". Arianespace. ↑ "Arianespace orbits Star One C2 and VINASAT-1: Second successful launch in 2008". Arianespace. ↑ "Successful dual launch for Arianespace: Skynet 5C and Turksat 3A in orbit; 25th successful launch in a row for Ariane 5". Arianespace. ↑ "Another successful Arianespace launch: ProtoStar I and BADR-6 are in orbit". Arianespace. ↑ "Another successful Arianespace launch: Superbird-7 and AMC-21 in orbit". Arianespace. ↑ "Two Eutelsat satellites are orbited by Arianespace on Ariane 5's 28th consecutive mission success". Arianespace. ↑ "Ariane 5 begins 2009 with another successful launch at Arianespace's service". Arianespace. ↑ "Arianespace launches two spacecraft on missions to explore the universe". Arianespace. ↑ "Ariane 5 soars to another heavy-lift success in lofting the TerreStar-1 mobile communications satellite". July 1, 2009. ↑ "Ariane 5 soars to another heavy-lift success in lofting the TerreStar-1 mobile communications satellite". spaceref. 9 June 2009. Retrieved 23 December 2015. ↑ "Another Arianespace launch success and a new commercial record for Ariane 5". Arianespace. October 1, 2009. ↑ "Ariane 5 delivers the NSS-12 and THOR 6 television broadcast satellites on Arianespace's sixth mission of 2009". Arianespace. October 29, 2009. ↑ "Arianespace delivers Helios 2B into Sun-synchronous polar orbit on Ariane 5's seventh flight of 2009". Arianespace. December 18, 2009. ↑ "Arianespace's double success: 50th Ariane 5 mission, 36th successful launch in a row—ASTRA 3B and COMSATBw-2 in orbit". Arianespace. May 21, 2010. ↑ "Mission accomplished! Arianespace orbits Arabsat-5A and COMS". Arianespace. June 26, 2010. ↑ "Arianespace Flight 196 orbits satellites for Africa and the Middle East". Arianespace. August 4, 2010. ↑ "Arianespace orbits satellites for Eutelsat and B-SAT". Arianespace. October 28, 2010. ↑ "Arianespace orbits INTELSAT 17 and HYLAS 1". Arianespace. November 26, 2010. ↑ "Arianespace 6 for 6 in 2010: Last mission of the year orbits Hispasat 1E and Koreasat 6". Arianespace. December 29, 2010. ↑ "Mission accomplished! ATV2 cargo vessel en route for the International Space Station". Arianespace. February 16, 2011. ↑ "Arianespace launch for Asia and India ST-2 and GSAT-8 satellites in orbit". Arianespace. May 20, 2011. ↑ "A boost for direct broadcast satellites: ASTRA 1N and BSAT-3c/JCSAT-110R in orbit". Arianespace. August 6, 2011. ↑ "Arianespace launch a success: Arabsat 5C and SES-2 in orbit". Arianespace. September 21, 2011. ↑ "Mission accomplished! Arianespace launches ATV Edoardo Amaldi cargo vessel to the International Space Station". Arianespace. March 23, 2012. ↑ "Ariane 5 ECA rocket orbits JCSAT-13 and VINASAT-2". Arianespace. May 15, 2012. ↑ "Ariane launches communications, weather satellites". spacetoday.net. July 6, 2012. ↑ "Arianespace launch a success: Ariane 5 ECA orbits Astra 2F and GSAT-10 satellites". Arianespace. September 28, 2012. ↑ "Arianespace launch a success: Ariane 5 ECA orbits Eutelsat 21B and Star One C3 satellites". Arianespace. November 10, 2012. ↑ "Ariane 5 ECA orbits Skynet 5D and Mexsat Bicentenario satellites: 10 years of success, 10 tons of performance, 10 launches in 2012". Arianespace. December 19, 2012. ↑ "Ariane 5 delivers a record payload and completes back-to-back successes for Arianespace's launcher family". Arianespace. February 7, 2013. ↑ "Mission accomplished! Arianespace launches ATV4 Albert Einstein cargo vessel to the International Space Station". Arianespace. June 5, 2013. ↑ "Arianespace launch VA214: Mission accomplished! Ariane 5 ECA orbits Alphasat and INSAT-3D". Arianespace. July 25, 2013. ↑ "Arianespace delivers! EUTELSAT 25B/Es'hail 1 and GSAT-7 are orbited by Ariane 5". Arianespace. August 29, 2013. ↑ "Arianespace launch VA 217: Mission accomplished! Ariane 5 ECA orbits ABS-2 and Athena Fidus". Arianespace. February 6, 2014. ↑ "Service continuity for established customers: Arianespace's Ariane 5 orbits satellites at the service of SES and HISPASAT". Arianespace. March 22, 2014. ↑ "A milestone Ariane 5 mission with ATV payload underscores Arianespace's capabilities for Europe". Arianespace. July 29, 2014. ↑ "Ariane 5 delivers MEASAT-3b and Optus 10 into orbit on its 61st consecutive successful mission". Arianespace. September 11, 2014. ↑ "Arianespace delivers for Latin America! Ariane 5 orbits Intelsat 30 and ARSAT-1 on its latest success". Arianespace. October 16, 2014. ↑ "Ariane 5 delivers DIRECTV-14 and GSAT-16 to orbit on Arianespace's latest mission success". Arianespace. December 6, 2014. ↑ "A dual-payload success for Europe: Arianespace's Ariane 5 gives a "lift" to the THOR 7 and SICRAL 2 satellites". Arianespace. April 26, 2015. ↑ "Arianespace delivers for the Americas! DirecTV-15 and SKY México-1 are orbited by Ariane 5". Arianespace. May 27, 2015. ↑ "Keeping up the pace: Ariane 5 orbits Star One C4 and MSG-4 on Arianespace's sixth flight in 2015". Arianespace. July 15, 2015. ↑ "An "on the numbers" Ariane 5 success for two long-time Arianespace customers: Eutelsat and Intelsat". Arianespace. August 20, 2015. ↑ "Maintaining Arianespace's 2015 launch cadence: Ariane 5 orbits Sky Muster and ARSAT-2". Arianespace. September 30, 2015. ↑ "Arianespace orbits Arabsat-6B and GSAT-15 satellites for Arabsat and ISRO" (Press release). Arianespace. November 10, 2015. ↑ Clark, Stephen (January 28, 2016). "First Intelsat Epic satellite deployed by Ariane 5 rocket". Spaceflight Now. Retrieved March 25, 2016. ↑ Bergin, Chris (March 8, 2016). "Ariane 5 successfully launches Eutelsat 65 West A". NASASpaceFlight.com. Retrieved March 25, 2016. 1 2 Clark, Stephen (24 November 2016). "Spaceflight Now — Launch schedule". Spaceflight Now. Retrieved 27 November 2016. 1 2 "Arianespace celebrates Asian anniversaries and plans six regional satellite launches in 2016" (Press release). Arianespace. 31 May 2016. Retrieved 21 June 2016. 1 2 3 4 Clark, Stephen (11 January 2016). "Record pace of Ariane 5 flights planned for 2016". Spaceflight Now. Retrieved 21 June 2016. ↑ Krebs, Gunter. "Al Yah 3". Gunter's Space Page. Retrieved 21 June 2016. ↑ "Arianespace to Launch Two ViaSat High Capacity Satellites" (Press release). Arianespace. 9 February 2016. Retrieved 21 September 2016. 1 2 "SES – Upcoming launches". SES S.A. Retrieved 29 March 2016. ↑ Krebs, Gunter. "Eutelsat 172B". Gunter's Space Page. Retrieved 18 August 2016. 1 2 "Arianespace at the 2016 ILA Berlin Air Show" (Press release). Arianespace. 1 June 2016. Retrieved 9 June 2016. ↑ Krebs, Gunter. "BSat 4a". Gunter's Space Page. Retrieved 18 August 2016. ↑ Krebs, Gunter. "Azerspace 2/Intelsat 38". Gunter's Space Page. Retrieved 18 August 2016. ↑ "Arianespace selected by Airbus Defence and Space to launch EDRS-C satellite". Arianespace. 19 March 2015. Retrieved 4 October 2015. ↑ Krebs, Gunter. "GSat 11". Gunter's Space Page. Retrieved 18 August 2016. ↑ Krebs, Gunter. "GSat 17". Gunter's Space Page. Retrieved 18 August 2016. ↑ "Avanti Completes Contracts for HYLAS 4" (Press release). Avanti. 11 August 2014. Retrieved 18 August 2016. ↑ "Brazil prepares satellite for launch". telecompaper. 18 May 2016. Retrieved 18 August 2016. ↑ "BEPICOLOMBO - Fact Sheet". ESA. 20 April 2016. Retrieved 2016-05-03. ↑ Kubo, Nobuhiro (July 19, 2016). "Tarpaulin delays Japanese military communications satellite by two year". Space News. Retrieved 2016-08-03. ↑ "業績予想の修正に関するお知らせ" (Press release) (in Japanese). SKY Perfect JSAT Holdings Inc. 17 June 2016. ↑ Clark, Stephen (April 29, 2015). "Arabsat contracts go to Lockheed Martin, Arianespace and SpaceX". Spaceflight Now. Wikimedia Commons has media related to Ariane 5.